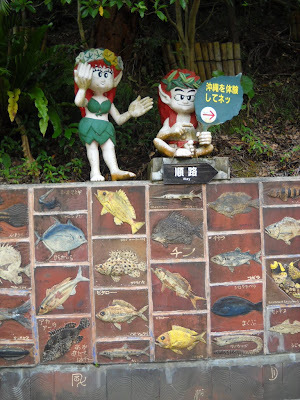 Ryukyu Mura is a theme park presenting the traditional Okinawan culture. I have presented it in other posts as well. There are almost 200 year-old houses of various architecture and different crafts here. It is a recreation of the old Okinawan village life. Old houses were brought from many islands and reassembled here. I noticed this splendid wall with fish depictions. Have a nice weekend! And do choose in the sidebar whatever you prefer reading on my blog, so that I could change its content accordingly. Thank you!